Cyber Monday is November 26, 2018, the first Monday after Thanksgiving. It was christened by Shop.org in 2005. At that time, shoppers needed the faster internet speeds from work computers to shop online. Now, personal laptops and mobile devices are as fast as work computers. In 2017, it was the biggest shopping day of the year. According to Adobe Digital Insights, online shoppers spent $6.6 billion, 16.5 percent more than in 2016. Cyber Monday sales replaced those of Black Friday, which only received $5 billion in online sales. Three-fourths of shoppers dive in first thing Monday morning. Twenty-five percent shop during lunch and 34 percent go online Monday night. Only 19 percent take advantage of Cyber Monday sales the rest of the week. Cyber Monday shopping has started earlier every year. Nearly a third of shoppers begin Cyber Monday on the Sunday before. Top stores like Walmart, Amazon, and Target, start Cyber week sales on Thanksgiving Day itself. The best way to get in on their deals is to sign up for their email newsletters. Cyber Monday has set new records each year since its inception. Since 2009, Cyber Monday sales have more than tripled, as the chart below shows. $1.038 First time more than $1 billion in sales. $1.5 Mobile devices equaled 12.9%. $2.29 Sales rose 20%. Black Friday fell. $3.04 Stores offered discounts on mobile devices. Cyber Monday shoppers are very clear about why they like the day. More than 40 percent of time-strapped shoppers said the 24-hour convenience is their highest priority. Almost as many listed their desire to avoid the crowds on Black Friday as their primary reason for shopping online. Almost a third of online shoppers said they like the ability to easily compare prices. The strong results on Cyber Monday are because of the aggressive sales offered by retailers with an online presence. Almost 90 percent of retailers offered Cyber Monday sales. Forty-five percent of retailers offered coupons or a percentage discount while more than one-third had limited-time-only promotions. Fewer or 15 percent promoted a free gift-with-purchase. More than half of retailers offered to increase their "free shipping" budget, while one-third of retailers offered free shipping even earlier than ever. These retailers are smart because 36 percent of shoppers surveyed said they'd increase their online shopping only if shipping were free. Only a few online shoppers said they would buy less, thanks to expensive shipping charges. Others didn't like that they weren't able to see or handle their purchases ahead of time. Some customers didn't like having to wait for it to be shipped. Shoppers are using social media more than ever. Almost one-third said they would go to a company's Facebook page to get additional information about Cyber Monday sales. Twice as many would look at customer reviews on the company's website before buying any products or services. Online retailers respond to shoppers' use of mobile technology and social media by promoting there. More than half of retailers made sure their website sales were optimized for mobile devices. Another 20 percent optimize for tablet device apps. More than a third use QR codes in magazine and billboard ads. Online retailers also maximized their use of social media. Almost three-quarters said they'd promote sales on their Facebook pages while more than 40 percent promoted on Twitter. According to the National Retail Federation Annual Survey, 40 percent of tablet users compare prices, while 20 percent redeem coupons. Most important, almost a third buy online using their tablets. 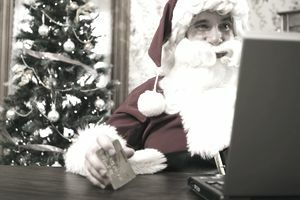 Retail sales can be found on CyberMonday.com, which features a schedule of what retailers offer deals at what times in a "Deal of the Hour" promotion. You can find sales from more than 800 online retailers. ComScore reports that more than half of the deals consists of free shipping. Retailers also offered various price discounts. Other offers included free gifts with purchase. Cyber Monday reflects the growth of internet retailing. By 2020, it is expected to reach $523 billion, growing almost 10 percent annually. The increasing power of cell phones is driving that growth. In 2017, people in 16 countries said that 60 percent of their “everyday transactions” occurred in a digital form instead of a store. The success of internet retailing spells doom for brick-and-mortar stores. In 2018, former J.C. Penney CEO Mike Ullman said that only 25 percent of America's 1,200 shopping malls will survive over the next five years. Those that do will serve the highest-earning 20 percent. Ullman said that only malls that can attract an Apple or Tesla store would survive. In 2018, retailers filed for bankruptcy at record-high rates. Well-known brands such as Nine West, Claire's, and Toys R Us announced bankruptcy in the first four months of the year.